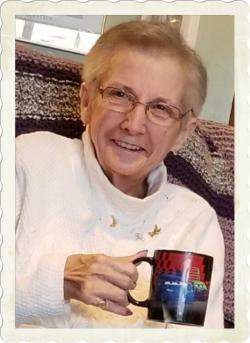 The family of Zeta Joan DeCourcey Baxter, devoted wife of Fred Baxter, sadly announces her death at the Dr. Everett Chalmers Hospital, Fredericton, on Wednesday April 3, 2019, after a courageous battle with cancer. Born in Sussex NB, May 7, 1944, the daughter of the late J. Stanley and Josephine DeCourcey. During Zeta’s early working career, she was employed at Irving Oil Head Office in Saint John and the Department of Justice in Fredericton. She, husband Fred and family spent several years in Calgary and then returned to Fredericton where she and her husband were co-owners of Pewtersmith Studio, Raintree Wood Products as well as the Community News, a local community paper. Besides her husband Fred, she is survived by son Andrew (Rebecca) of Toronto and granddaughter Kassidy of Peterborough, daughters, Jennifer (Chris), granddaughter Jordyn (Nick) and grandson Jacob, daughter Jodi (Ed) all of Fredericton and grandson Jesse (Brittany) of Fort McMurray, two brothers, Cyril (Suann) of Winnipeg, and Harold (Dawn) of Fredericton, sisters Sharron Doyle (Rick) of Ottawa, and twin sister Zona Bovingdon (Ted) of Fredericton. Chosen sisters, Dorothy Keays of Halifax, Carolyn Parent (Herb) of Burton and chosen brother Robert Tucker of Alberta, sister-in-law Freda DeCourcey, as well as many nieces and nephews. In addition to her parents, Zeta was predeceased by brother Tony, and three infant sisters, Anne Marie, Mary Elizabeth and Josephine Anne. The family will receive friends at Bishop’s Funeral Home 540 Woodstock Road Fredericton on Friday evening from 7-9 pm. A celebration of a life well-lived, will be held at Holy Family Church, 1500 Hanwell Road, Fredericton, NB on Saturday April 6, 2019 at 12:00 pm with Father Tom Fowler officiating. Burial will be held at a later date. The family will welcome those who wish to express their condolences at a reception in the hall on the lower level of Holy Family Church following the funeral Mass. Donations to the Palliative Care Unit at the Chalmers Hospital or a charity of the donor’s choice would be greatly appreciated. The family would like to extend a sincere thank you to all those who visited, and offered their support as well as their prayers. Special thanks to Dr. Paula Carmichael, Dr. JenniferGillis-Doyle, and Dr. Gordon MacDonald as well as the doctors, nurses and staff of 3E, as well as Bayshore staff for the wonderful care Zeta received. Also thanks to Jim Bishop and the staff of Bishop’s Funeral Home, Fredericton. Your kindness will always be remembered.